Here's the description of the book from Bethany House Publishers: "During New York City's Gilded Age...The game is played amid banquets and balls. the desires of a young woman's heart. For a young society woman seeking a favorable marriage, so much depends on her social season debut. Clara Carter has been given one goal: secure the affections of the city's most eligible bachelor. Debuting means plenty of work--there are corsets to be fitted, dances to master, manners to perfect. Her training soon pays off, however, as celebrity's spotlight turns Clara into a society-page darling. Yet Clara soon wonders if this is the life she really wants. Especially when she learns her best friend has also set her sights on Franklin De Vries. When a man appears who seems to love her simply for who she is and gossip backlash turns ugly, Clara realizes it's not just her marriage at stake--the future of her family depends on how she plays the game." From start to finish, this book draws the reader in and takes the reader back to New York during the Gilded Age. All of the details--from the clothing to the furniture--make this world very real, and I quickly became involved in the story. Mitchell does a beautiful job of making everything seem so real, from the atmosphere to the emotions of the characters. And what intriguing characters they all are! Because of the first person point-of-view, it was easy to sympathize with the main character (Clara), and it was fun and enlightening to see her world through her eyes. Her options for suitors were quite the interesting lot, as well! Interestingly enough, the De Vries family reminded me a lot of the Tilney family from Northanger Abbey. (Although I confess to not having read Northanger Abbey yet; my impression was made from seeing the PBS version of the story.) I loved all of the dancing scenes, and I enjoyed learning about all of those social conventions of the day. This story takes a while to unfold, but to be really immersed into the time period I think there would be no way to rush the plot. In my opinion, the pacing is just right, and the whole reading experience makes it feel just like the reader is debuting with Clara. And, oh! how I loved how it all turned out! The story is written beautifully and really demonstrates the wonder of unconditional love. With a great message about what is truly important in life, as well as the book being such a great love story, I highly recommend it! Get Ready for a Birthday Bash to Remember! All you Toy Story, Toy Story 2, and soon-to-be Toy Story 3 fans, here's a heads-up! 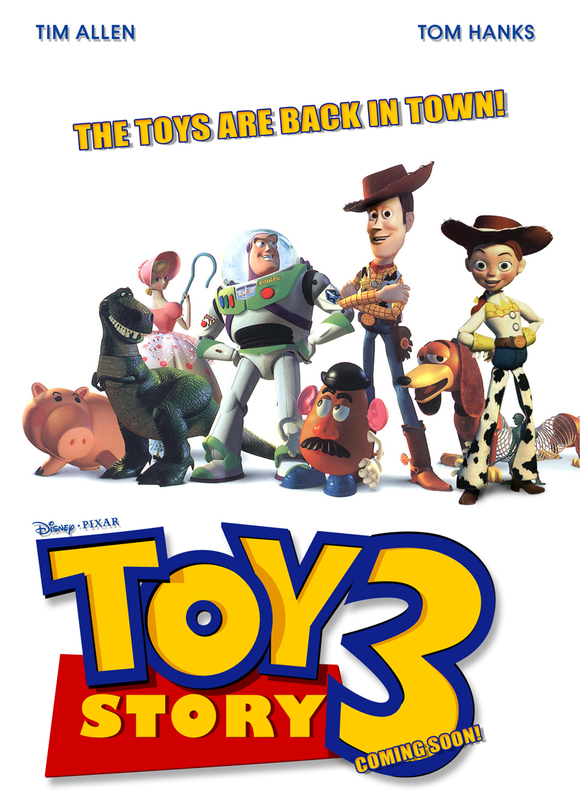 Next week's theme on my blog is going to be Toy Story, and there's lots of fun in store! To get the ball rolling, I'll be posting a poll in the sidebar, and I would love for all of you to participate! "Native American beauty Sunny Westcott is not one to let her hair down. But her friend Aubrey manages to drag her to Pendleton, Oregon, and the pair arrives just as the hundredth annual Pendleton Round-Up begins. Sunny is surprised by how much she enjoys watching the rodeo, riding horseback, and getting to know Aubrey’s family—particularly a handsome cowboy named Cody. Pendleton is also home to the Umatilla reservation where Sunny’s ancestors once lived, and the trip gives her the chance to do some digging into her family’s history—a topic she knows next to nothing about. But will Sunny like what she finds? And how will skeletons from the past compete with the current drama unfolding in Cody’s own family?" The aspect I enjoyed most about this book was its description of Pendleton--the imagery, history, and the information about the Pendleton Round-Up. It was a lot of fun getting to learn about this place, and I appreciate Carlson's knowledge of Pendleton! Going with the characters to some hole-in-the-wall places, learning about the museums and restaurants, and learning about the Umatilla reservation was all very interesting! For a "Love Finds You" book, the focus seemed to be mainly on the character's search to learn more about her heritage, rather than any romance. That part didn't really develop much until the end of the story, where it all came rather quickly (and a bit unbelievably) together. But I think for the most part, many of the characters felt real and acted like people do in real life. However, I think the spiritual aspects of the book were down-played a bit. That is to say, it felt kind of like the prayer and mentions of God were just kind of "thrown in" there occasionally. All in all, this book is well-written, and a fun escape to a small town with some great attractions. The story is an interesting look into one person's heritage, and I appreciated that part of the story. I would recommend it for all those looking for the "fun escape" I mentioned. I'm just not sure I would recommend it as a deep, insightful romance story. Thanks so much to Renee at Black 'n Gold Girl's Book Spot for passing this award on to me! What a great birthday gift! 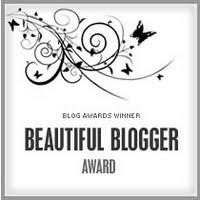 From the blog Publish or Perish: "The rules to the award are: link to the person who nominated me for this award; share seven interesting things about myself; and nominate seven other beautiful bloggers." 1. I'm a black belt in Jujitsu. 2. I hate mashed potatoes. 3. I was valedictorian of my graduating class at high school. 4. I love bluegrass music. 5. I'm majoring in English at Corban University. 6. I've been to Israel. 7. I was president of my high school's Key Club during my junior year. To those of you who keep getting tons of awards from me . . . I'm not trying to be a bother! I hope you can consider it a compliment that I think of you so often when I'm handing out awards! Thank you all for reading my blog, and I hope you'll check out some of these other great blogs! Happy Tuesday, everyone! I thought I would share with you some of the coming events on my blog. Right now I'm reading Love Finds You in Pendleton, Oregon, and I'll plan on reading Love is Monumental after that. (However, I'm still eagerly awaiting the arrival of She Walks in Beauty in my mailbox, as well as Love on a Dime, so I'll plan on reading them soon, too!) Anyway, reviews for these books should be posted soon! And next week, get ready for my "Birthday Story Bash!" Some of you have already heard about this on Goodreads, but for those of you who haven't: to celebrate my birthday week, I'm having a Toy Story theme on my blog. And what would a party be without party favors? Due to some generous blogging friends of mine, there will be some great book giveaways next week! I hope to see you all here! I'm sorry there haven't been more posts so far this week. I guess all those camp activities wore me out! (Just kidding!) But I hope to see you all here next week for the big bash on my blog! Thank you, Lori! I love this award, and I'm so honored to accept it! Lori from ~Some of My Favorite Books~ kindly passed this award on to me, and now I have a chance to pass it on, as well! These are the instructions for this award: If you are given this award you must first accept it by leaving a comment on the post you were nominated on. Then copy and paste the post and add it to your own blog. Make a list of the last 5 books you read and pass the award on to 5 other bloggers (no backsies!). Please also identify the blog from which you got the award and don’t forget to tell them they have a blog award! Thanks, ladies, for your lovely blogs! Hope you all are having a wonderful weekend! P.S. This is my 50th post!!! Thank you all for making my first 50 posts so special by leaving such kind comments! It's a good thing we're talking about making this annual, because I'm going to miss being at camp! But I'm comforted by the fact that what really made camp special was all of you and your wonderful comments and participation--and hopefully you'll all still be tuning in to my blog even after camp! So this farewell is for the end of the camp this year, but not to all of you. There's still lots more summer fun coming up! I made this video as a tribute to camp. It's a commemoration of our great week camping together, even though I technically made it before camp officially started! Hope you enjoy it and see you soon! What a week this has been! Our official farewell will be tomorrow (we'll save our packing until then), but I just wanted to let you know that I've had a wonderful time with all of you! You're a lovely bunch of campers! Grab some smore fixings and grab a seat while I share the winners of the two giveaways. First, thank you to all of you who entered! I loved reading all of your comments! Separating from the group in order to take a picture of an adorable bunny was not Ruth's best idea. She had been thrilled to join a hiking club for the summer, but the thought of getting lost had never crossed her mind. With the sun already falling rapidly down the western half of the sky like an autumn leaf being detached from its high place, a shiver of nervous, not-quite-complete fear ran through her. Too bad she had such a horrible sense of direction. Back at home she couldn't even find the store she had worked at for months on her own--she needed to follow her neighbor (who happened to be one of her co-workers) to work every morning. But the only creature she could follow right now was the bunny, so when it hopped into some bushes she set off after it. She hadn't planned on coming face-to-face with a giant blue horse! He had the most beautiful silver mane. He stood staring at her like he was expecting something. She reached out to touch him, and he turned, and walked to a nearby tree stump, which was rotten with age. He seemed to be asking her to get on his back, so she jumped onto the stump, praying it didn't crumble beneath her, grabbed onto his neck and jumped on. Just then, he took off at a lighting speed. Ruth held on with all her might, thankful she knew how to ride a horse. As the horse galloped through the woods Ruth realized it was headed straight for a huge tree. Bracing herself for the impact Ruth clung to the horse and closed her eyes. Ruth heard a whoosh and opened her eyes to see the horse gliding up along a rainbow! Ruth gasped as she realized the ground was falling beneath them. The rainbow sparkled and glittered, and the horse began to change rainbow colors with it. She watched as the rainbow led them straight to the land of Oz! But after meeting the scarecrow, the tinman, and the cowardly lion, she decided that enough was enough. Ruth desperately tried to click her heels together, wishing she had a pair of ruby shoes. "Ruth! Wake up!" Startled, Ruth sat straight up to find herself in a tent, surrounded by a few of the concerned girls from her hiking group. "That must have been some dream!" As Ruth nodded, she thought she saw a rainbow-colored horse gallop past the tent. She simply smiled and said, "Where are we going today?" Thank you to all my fellow contributors: Bluerose, Angie, and Ariel! It turned out to be quite an interesting story! I'll close out the final campfire meeting of Camp Humility with 1 Peter 5:5-6, "Likewise, ye younger, submit yourselves unto the elder. Yea, all of you be subject one to another, and be clothed with humility: for God resisteth the proud, and giveth grace to the humble. Humble yourselves therefore under the mighty hand of God, that he may exalt you in due time." But you joined me today to talk about crafts, huh? To be honest, I don't think I'm very creative when it comes to making crafts. I like doing activities that come from kits and that show you step-by-step instructions! I guess my creativity is more in the writing department! But one "craft" I do enjoy is cross-stitching. (I'm not sure if this counts, but we'll pretend it does!) My grandma taught me how to cross-stitch, and I really appreciate her patience in teaching me. I love spending time with her! My first cross-stitch piece was from a kit--a blue fish with sunglasses that is now hanging proudly in my sister's and my bathroom. Both of my other completed pieces were from kits, too, but I think I've improved some! It's been quite a while since I last cross-stitched, but I'm so glad I learned and I hope I can remember how to cross-stitch for the time when I decide to pick up the needle and fabric again! A thirteen-year-old Amish girl finds solace in an abandoned barn—one she was forbidden to go to. When someone seems to be tampering with the things she leaves there, she finds more trouble than that which her three brothers create at home. But her “summer secret” might just bring some positive changes to her life. A Summer Secret is an enjoyable summer read! I think children around middle-school age might especially enjoy it, although some might find it a bit long unless they’re avid readers. But even though I’m older than the target age, I was still intrigued by the story, even if some parts weren’t as exciting to read. At first, the fact that the main mystery was a secret that the protagonist kept from others (except for her twin brother) worried me. But never fear! As long as this book is read through to the end, good moral lessons will be found. I appreciated the way the story turned out, and overall I think the target age will have found a series to follow! Readers, you can find this book from Amazon.com at: http://www.amazon.com/Summer-Secret-Mysteries-Middlefield/dp/140031593X/ref=sr_1_1?ie=UTF8&s=books&qid=1274439186&sr=8-1. Or you can find this book from Thomas Nelson at: http://www.thomasnelson.com/consumer/product_detail.asp?sku=140031593X&title=The_Mysteries_of_Middlefield_Series_#1__:_A_Summer_Secret. How is everyone this evening? It's a bit breezy tonight, so I hope you all have something warm on! I think I have some more smore fixings, so go ahead and help yourself! Well, our week together is coming to a close. We have one more full day of camp, and then we will say our "farewells" on Saturday. I hope you have had a great time at camp--I know I have! Thanks to all of your sweet, fun comments, I've made some great memories. Maybe we'll have to make Camp Humility an annual event . . .
We bless Thy holy name, glad praises we sing." Psalm 40: 3 says, "And he hath put a new song in my mouth, even praise unto our God: many shall see it, and fear, and shall trust in the Lord." Our God is so good! Because of His grace through Jesus, we can go to Heaven to be with Him forever. Forever. How amazing, how marvelous, how glorious is our God! And He is more than deserving of our worship and songs of praise. First Kings 8:22-23 says, "And Solomon stood before the altar of the Lord in the presence of all the congregation of Israel, and spread forth his hands toward heaven: And he said, Lord God of Israel, there is no God like thee, in heaven above, or on earth beneath, who keepest covenant and mercy with thy servants that walk before thee with all their heart." There is no God like our wondrous God! Remember Psalm 43:3 from a few nights ago? "O send out thy light and thy truth: let them lead me; let them bring me unto thy holy hill, and to thy tabernacles." Now read the following verse (verse 4): "Then will I go unto the altar of God, unto God my exceeding joy: yea, upon the harp will I praise thee, O God my God." He is our joy! He is our reason for living, and our hope for everlasting life. So let us praise Him, not just now, but every day. Our words can never be enough to show our true appreciation, but He looks at our hearts. Let us worship Him in love with all of our hearts, not just with our voices, but with our lives. Let us seek His will, for His purposes are what really count throughout eternity. And gladly our songs of true worship we raise. To Thee, our great Redeemer, forever be praise." Hello my fellow campers! Let's all gather in the mess hall so I can pass out the mail! Renee: Thanks so much for telling your readers about camp this week! It has been so much fun to have you here! I'm sorry the rafting might have been a tad scary for you, but it was great to hang out by the campfire together! ;) You are such a great friend! Ariel: It was great to go hiking and rafting with you! I'm so glad you enjoyed the view on our hike, and I hope your rafting experience this time was a little more fun for you. :) I had a great time talking by the campfire with you! Bluerose: It was so fun having you join us this week! (Congratulations on your new blog, by the way! If the rest of you didn't know, Bluerose is doing a great giveaway on her blog--you can find the link in my sidebar.) I'm sorry you didn't get to do the trust game with us while we were rafting. ;) However, the hike was great and I really appreciate you starting out our game for us last night! Angie: I'm so glad you got to see the mountains and enjoy the woods this week with us! Next time you come, we'll have to go canoeing instead of rafting. ;) Thanks for playing the game with us, and thanks for taking the time to stop by so often! Donna: So great to see you here this week! I hope the rafting was enjoyable for you, and if you ever choose to go again, I'm sure you'll be able to find a great guide who will make sure you'll be safe! ;) It was so fun to have you join us, and I hope to see you around again soon! Hannah: What can I say? Your being here has been too much fun! :) I loved talking with you by the campfire, and I'm so glad you got to come here instead of going to boot camp. ;) Hope we can talk more during the rest of camp soon! Casey: Thanks so much for visiting this week! :) I'm sorry to see you haven't pulled any pranks on anyone yet, but there's still time... ;) Just kidding! Anyway, so good to have you come to camp! Thank you all for coming this week! And there's still more fun planned, so don't leave yet! We've been keeping busy here at Camp Humility! We've gone rafting and hiking, played some games, and spent some time each evening talking around the campfire. I miss you and hope you are having as much fun as I am (although I'm not sure if that's possible)! See you soon! One more item of business: Instead of posting the story here, I'm going to wait until tomorrow night (when I announce the winners at the campfire) to share the completed story (from last night's game). So there's still time if you would like to contribute! See you at the campfire tonight! Gather around the campfire! We're on our third evening of Camp Humility, and I hope you've been having fun! Tonight is our night game. As much fun as it would be to play flashlight tag or some crazy organized team game, I have something different in mind tonight. But I'm going to need a lot of participation from all of you! I'm going to start us off by writing a beginning paragraph for a story. (We'll try to stick to the camping/nature theme if we can!) The next person to leave a comment takes up the story where I left off, writing the next paragraph. Then another person continues the story with a paragraph after that. And so on and so forth. Feel free to be as creative (and crazy!) as you want! The length of the paragraphs is not very important, but try not to go over 7 sentences or under 3 sentences (just as a guideline). Tomorrow when I do the "mail call," I'll share the complete story with everyone. Now, let's get writing! Separating from the group in order to take a picture of an adorable bunny was not Ruth's best idea. She had been thrilled to join a hiking club for the summer, but the thought of getting lost had never crossed her mind. With the sun already falling rapidly down the western half of the sky like an autumn leaf being detached from its high place, a shiver of nervous, not-quite-complete fear ran through her. Too bad she had such a horrible sense of direction. Back at home she couldn't even find the store she had worked at for months on her own--she needed to follow her neighbor (who happened to be one of her co-workers) to work every morning. But the only creature she could follow right now was the bunny, so when it hopped into some bushes she set off after it. She hadn't planned on coming face-to-face with . . .
Now it's your turn! Who'll start off the next part of the story for us? Good morning, campers! Today we're off on a hike. I hope you all brought your hiking boots and maybe a coat--it can be rather chilly in the morning when you're out of doors! To give you an idea of what we're seeing as we're walking along, I thought I would share some pictures I've taken. (These pictures are from Sunriver and close to Bend, Oregon.) Hope you enjoy the sights! Don't you just love the big, blue sky? If you look closely, you might be able to see the moon! Doesn't this spot look inviting? I love the birdhouse and birdfeeder--just the right touch for this scene. Maybe we'll see some birds soon! Well, what do you know? Here are some birds! Aren't those ducklings adorable? We've climbed upwards now. I love the view! Everything just fades into the horizon . . . If you look through those trees over there--just stand right here where I am--you can see what I believe is Mt. Bachelor in the distance. God's creation is so beautiful, isn't it? Well, I think that's about as far as I can go. I'm getting kind of winded, so I think I'll head back to camp. I hope I can see you all tonight for the night game! I'll try to get everything started by mid-afternoon or early evening (here on the West Coast), but feel free to stop in at anytime during the evening/night! Hope you enjoyed our hike! I hope everyone had fun rafting today! I know I sure did. Although I have to say, I'm glad to be around a campfire now so I can dry off after that thorough soaking this afternoon. Those rapids were pretty intense! Now, first off I'd like to say that tomorrow should be a fun and busy evening, as I'm hoping to get all of you to participate in a game I have planned! But for tonight, I think some silence might be in order. Ecclesiastes 3:7b says, "A time to keep silence, and a time to speak." (This comes a while after the first verse of the third chapter, which says, "To every thing there is a season, and a time to every purpose under the heaven.") There are times when something needs to be said, whether that something includes words of comfort, words of encouragement, or words of gratitude. But there are also times when it is better not to say anything at all. This can be in reference to times of grief when someone just needs someone to hear them and let them cry, or it can refer to times when we need to listen to someone's voice other than our own. And how often we forget how much we need to take time to listen to the Someone who matters most--our Lord. I mentioned during our rafting trip that I had been to a Christian camp called Veritas. At this camp we had time set aside to spend in God's word, in prayer, and/or journaling. This time was called "TAWG"--"Time Alone With God." I'd like to suggest that we have some TAWG right now. Take some time for silence. Take some time to listen to God. He is so patient and so good to listen to our prayers; how much more may we be willing to listen to what the Lord has to say to us! Here we are by the banks of the river, and everyone's ready, right? Are you wearing clothes that can get wet? Are you wearing your life jacket (properly strapped on)? Do you have your paddle? Are you ready for an exciting and thrilling adventure? Good! I think/hope we're ready! So off we go! As we're rafting along down the river, I'll tell you some of my rafting stories: The picture you see above is from the Bigfoot Rafting Company's website(http://www.bigfootrafting.com/index.html). The Bigfoot Rafting Company is located in Willow Creek, CA. And unless I have a worse memory than even I feared, this was the rafting company that guided our class' rafting trip when I was in the eighth grade (we only had 12 students in our seventh and eight grade classes that year, and small classes allow for fun class trips). I really enjoyed rafting with this group, and it was great fun going down the rapids. I remember a time, though, when we were at a still part of the river. Taking advantage of the calm waters, we decided to play a game. (Now, if you've been rafting before, you will recall that the end of the paddle has a "T" shaped handle, as long as all rafting paddles are the same! This makes it easier to really grip the handle.) The group in my raft (including myself and some parents), all got up on the sides of the raft. There was enough room to stand on the sides (it was like standing on a semi-stable and rather large inner tube). Half of us were on one side of the raft, and half were on the other. We locked our "T"-grip handles with the person across from us and leaned back. (Yes, this was like a trust game.) Can you guess what happened next? This exercise surprisingly can work, but if one person falls off . . . well, generally all of the group falls off. Boy, was that river cold! Thank goodness for a nice parent who pulled me up out of the river and back into the raft! But let me tell you, playing a game is not the only time when you're rafting that you can get wet! And sometimes, you have a choice to get as wet as you want. For example, when I went rafting with a group from camp Veritas (a Christian camp in Oregon that was mainly hosted at the college I am now attending, although it was not put on by that college! ), we got to a spot where we could get out and float down a rapid. Yes, I said float down a rapid! Feet first, flat on my back in the water, down this one rapid I went. It was a bit scary, to be honest, because the waves kept coming at me and I was hoping I would be able to get enough air to breathe. But as you can guess, I made it (and I think I should clarify that we were all still wearing our life jackets). Overall, I've had some really fun times rafting. Going with a guided group allows for safety, as well as a good time! I think we're at a calm spot in the river now. Anybody up for a trust game? It's a bit chilly, so feel free to scoot closer to the fire! And I think there might be some fixings for smores on the picnic table yonder, so help yourself! Anyway, welcome to the first evening of Camp Humility! It's great to sit around a campfire and feel its warmth. And when it gets dark, it's so nice to have the light from the flames offer comfort--drawing people like moths while also drawing out deep thoughts. I'm not sure whether I associate a campfire more with songs and stories, or with silent comraderie as each person is lost in reveries. I suppose there is a place for both. Psalm 18:28 says, "For thou wilt light my candle: the Lord my God will enlighten my darkness" (KJV). Psalm 43:3 says, "O send out thy light and thy truth: let them lead me; let them bring me unto thy holy hill, and to thy tabernacles" (KJV). And Psalm 119:130 says, "The entrance of thy words giveth light; it giveth understanding unto the simple" (KJV). God offers us light--through His word, His guidance, and His very presence--and that light gives us fellowship with Him and also causes us to see a little more clearly His work in the world (and thus gives us reason to think more deeply). Jesus said, "I am the light of the world: he that followeth me shall not walk in darkness, but shall have the light of life" (John 8:12b). Jesus offers Himself as a light. He Himself is the light which brings us both closeness with God and thoughtful silence in our inability to fully comprehend His great love and His great plan. As we stare into the flames of the fire tonight, let yourself be warmed by God's love and awed into silence by that same love. Our God is an amazing God! So good to have you join me this evening. Be sure to get plenty of sleep so that you're ready for our rafting adventure tomorrow! Now, here's the itinerary so you can make sure you're all packed for a fun and refreshing week! On top of these posts, I'm planning on posting in the evening (Monday-Friday). 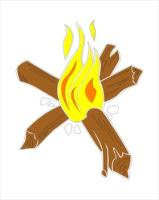 These evening posts will be our time around the campfire, with devotions and stories (except for Wednesday, which will be a fun night game!). At the last campfire Friday night, I will announce the winners of the giveaways. Yes, you heard me correctly. Giveaways (plural). From my own collection (for anyone interested), I will be giving away a gently used copy of A Bride in the Bargain by Deeane Gist and a gently used copy of Twice Loved by Lori Copeland. To enter, just leave a comment on this post saying which book drawing you would like to be entered in (choose only one). For extra entries, leave a comment on any of the posts between now and Friday evening (let's say 6:00 p.m. PST). Only one extra entry per post (although feel free to leave as many comments as you want!). You must leave your e-mail in your first entry comment. Anna Ivey's journey west with Mercer is an escape from the aftermath of the Civil War. She signed on to become a cook--not a bride. When she's handed over to Denton, her stubborn refusal to wed jeopardizes his land. With only a few months before he loses all he holds dear, can he convince this provoking, but beguiling, easterner to become his lawfully wedded wife?" From HarperCollinsPublishers: "Willow Madison and her friends Copper and Audrey taught school in neighboring Texas towns until the Yankees rode in and burned them out. In the midst of fear and chaos, survivors banded together to fight for what remained of their homes. Then word reached the people that the terrible war was over. Now penniless but still hopeful, Willow vows she will take care of her friends, and her ailing uncle, in Thunder Ridge, Texas, even if it means having to marry wealthy Silas Sterling, a man thirty years her senior. But standing in her way is sawmill owner Tucker Gray, with his enticing eyes and infuriating headstrong manner—the man Willow cannot get out of her head . . . or her heart. Even though her friends beg her not to give up her dream of happiness, Willow is determined to do the right thing for those who are dearest to her. But which path does God want Willow to take: a life of duty and commitment . . . or a life of everlasting love?" There you have it! Don't feel like you have to read and comment on every post, but please visit whenever you get a chance. Sign-up in the comments and let me know you'll be joining us at camp this week! Hope to see you soon! Here's the description of the book from Christianbook.com: "Desperate for a fresh start, McKenna Ashford accepts her cousin's invitation and moves west with her rebellious younger brother to the not-so-quaint mountain town of Copper Creek, Colorado. She arrives only to find that life there is far from what she expects. Having practically raised Robert on her own, McKenna is burdened both with her failure as a parent and her deep conviction to not let her brother throw his life away. Trusting has never come easily for her--especially in issues of the heart--and that inability to trust is put to test when she meets U.S. Marshal Wyatt Caradon. After years on the trail, Marshal Wyatt Caradon finds himself at a crossroads. He's brought countless men to justice, but he questions what lasting good his life has accomplished. When his path intersects that of young Robert Ashford, Wyatt glimpses himself, years ago, in the boy's pride and arrogance. He also sees a boy without a firm hand in his life. His well-meant attempt to help Robert brings him face-to-face with the one situation he never wanted to encounter--and the one woman who holds the key to helping him find his future. Set against the rich, untamed backdrop of the Colorado Rocky Mountains, The Inheritance is the first historical from WOMEN OF FAITH FICTION, and is a journey that explores the depth and breadth of a parent's love, the inherent risk in learning to trust, and the cost of laying down your life for one you love." What a beautiful and heartfelt message. I was so moved by this book it brought me to tears. The characters are so real, inlcuding their hurt, pain, troubles--and their love. I admired their perseverance and strength. What an amazing read! I have read a couple other Tamera Alexander books, and I have enjoyed them immensely. I've had this book for over a year, but I'm so glad it didn't get lost among my stacks of other books. I had been looking forward to reading this one, and I feel so very blessed to have finally done so! God's timing is always perfect, even when we don't completely understand it. While at times I wished the romance would be more prominent, I think the longing made the story even more real for me. The imagery was grand, and the story was touching. But I think it was the characters, as well as the message, that really made this story so great. Overall, I'm so humbled by how God can use people to write stories that bring glory to Him. I hope many others can read this book by Tamera Alexander! I very highly recommend it. First, I want to thank my readers for making "A Week at the Movies" so fun! I loved all of the comments--it was great to hear your thoughts! Next week's theme is "Let's Go Camping!" Of course we'll have to start getting things set up on Monday, like pitching tents and building the campfire. But then get ready for some great fun in the great outdoors! Hope to see you there! From the Zondervan website: "Beautiful and single, Guinevere Arlington knows her 'place' in the early twentieth century. She just refuses to stay there. Gwen loves her life in Idaho—the mountains, the town, her independence. But when she runs for mayor—and falls in love with her opponent—Gwen realizes winning may come at too high a price." First, I must make a confession: I read the second book in this series (Fit to Be Tied) before I read this one (which is the first book in the Sisters of Bethlehem Springs series). Happily, though, I still really enjoyed A Vote of Confidence, even though I knew some parts about the story before reading it. This book was a fun read! 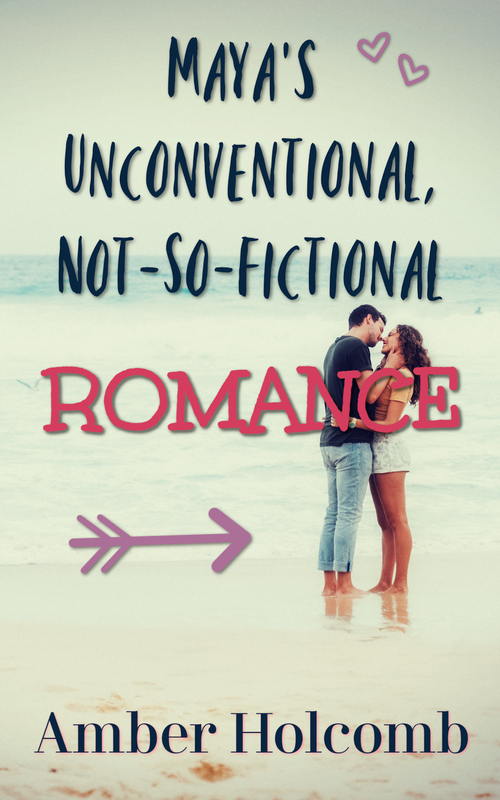 It was a sweet romance story that could be considered to be a bit slow-paced. However, it was great getting to know Gwen and learning with her the need for trusting God and His will, as well as the importance of relying on others. I admired Gwen's independent spirit, but I also appreciated her lesson in humility. And the romance in this story is so gentle and beautiful. Morgan (the hero) is a man one can respect and rely on, and it was great watching him fall in love. And I'll say it again--even after knowing the end result of this story, it still was a pleasure to read it! I also highly recommend Fit to Be Tied, the second book in the series. I think I might like it better than the first (I just love Cleo's character and the unlikely romance in this story!). I hope I get a chance to read the third book coming out soon: A Matter of Character. He has also written, acted in, and produced other movies/productions. I have seen all but the first two (and the last) on the list above, and I have loved each one of them. His movies have a purpose to them, and I think they really share God's love with the viewers. I am a big fan of the Love Comes Softly series, and I think the first three are my favorites. I also love The Last Sin Eater. I read the book after I watched the movie, and I thought the movie followed the book very nicely. What a moving story! The story shares a different, unique perspective on Jesus and His sacrifice, and in my opinion it is a great reminder of just how great the cost Jesus paid for our sins is and how great God's grace is. I highly recommend the movie for older teens and adults. For younger children, I happily recommend The Velveteen Rabbit. When I was younger, I used to watch an animated version of this story. 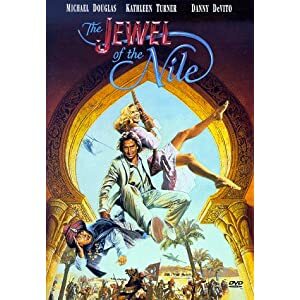 I think Michael Landon Jr.'s take on this story is superb, and I really enjoyed it. I think the combination of animation and real-life acting really added to the movie, and it is such a sweet story! I hope that When Calls the Heart really does come out this year! This is another movie based on a book by Janette Oke (who wrote the Love Comes Softly books), and I can't wait to see it! Do you have any favorite directors? You can also share any of your favorite producers, actors, stunt doubles . . . you're choice! Let's keep those credits rolling! Toy Story 2 is a keeper for sure! Part of the reason might be because my sister loved this movie so much when she was a little girl, and we just had to see Jessie when we went to Disneyland. She also carried around her little Woody doll at Disneyland, which was adorable! But besides that, I love this movie because it shows the importance of living in the present and enjoying every moment of time we spend with our loved ones. This movie has a stellar cast for the voices, and it's such a classic! I love the song that Jessie sings ("When She Loved Me"), even though it's bittersweet. Overall, I just love Toy Story 2! Finding Nemo is another favorite of mine. What beautiful animation, and what a beautiful story! With moments of hilarity and moments full of emotion, this movie really is moving. I personally love Crush and Squirt (and if you don't know who these characters are, you really must see the movie!). I also love the lesson of learning to let go and trust those you love, as hard as that can be. Although the characters in this movie are sea creatures, this lesson is so applicable to all of us. Even though we as humans aren't perfect, worrying and holding each other back won't do anyone any good. I love when Marlin tells Dory, "I promised I wouldn't let anything happen to him," and Dory replies, "You can't let nothing ever happen to him, or else . . . nothing would ever happen to him!" (Or something like that.) This life can be full of adventure, and God can use us for good if we let Him (and if we don't hold back!). When I first saw previews for Cars, I thought it was going to be a children's movie that wouldn't be very entertaining for teenagers and adults. Was I ever wrong! I watched this twice in theaters, and I've seen it many more times on DVD. Pixar animation always seems to get better and better! This movie, with its emphasis on community and living a simple life, is wonderful. I love the setting of a small town along Route 66! So fun! One of my new favorites is Up. I saw this movie the night before (I believe) my 18th birthday. The main character reminds me to some extent of my own grandpa, and I love how the movie is not only focused on this older man, but it portrays him as able to be strong. Up makes me cry every time I see it, especially the parts that have to do with the story of the main character and his wife. This is a touching movie that shows the importance of embracing the past, but then moving on and living life and loving others. It also shows how the memories we make aren't contained in the possessions we have, but rather in our hearts and how we live. This is such an excellent movie! I would recommend any and all of the Pixar movies, and I'm hoping to see many more in the future! How about you? Any favorite Pixar movies? 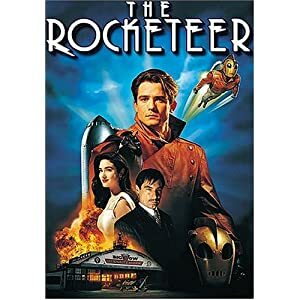 From Amazon.com: "The discovery of a top-secret jetpack hurls test pilot Cliff Secord into a daring adventure of mystery, suspense, and intrigue! Cliff encounters an assortment of ruthless villains, led by a Hollywood screen star who's a secret Nazi spy (Timothy Dalton). With the help of his actress girlfriend, the young pilot battles enormous odds to defeat his foes who are anxious to use the device in an evil plan to rule the world! The dangerous mission transforms the ordinary young man into an extraordinary hero!" This was an interesting movie. The film includes everything--from adventure, to drama, to danger, and even romance! There was some violence (shooting and evil henchmen and everything!) and some language (if I remember correctly), but overall it made for a fun movie to watch with my friend! From Amazon.com: "Disney celebrates a modern-day classic from the directors of The Little Mermaid and Aladdin. Discover what really happened after the princess kissed the frog in an inspired twist on the world's most famous kiss. This hilarious adventure leaps off the screen with stunning animation, irresistible music and an unforgettable cast of characters. 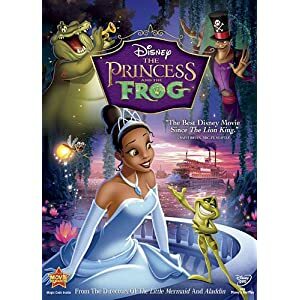 Enter Princess Tiana's world of talking frogs, singing alligators and lovesick fireflies as she embarks on an incredible journey through the mystical bayous of Louisiana. Spurred on by a little bit of courage and a great big dream, these new friends come to realize what's truly important in life...love, family and friendship. Overflowing with humor and heart, The Princess and the Frog is an incredible motion picture experience your whole family will want to enjoy again and again!" I saw this movie twice in theaters and a couple of times at home! This is such a wonderful movie! I can't resist a sweet romance from Disney, and this movie--with its great music and fun animation--didn't disappoint me at all. While some elements of this movie are scarier than other Disney movies (and I would say perhaps too much so for young children), I think the lesson of focusing on what you need rather than what you want is so important, and one I ought to remember. The emphasis on love (not just romantic love, but also love within a family and between friends) over wealth and even over dreams of success is commendable. If you haven't seen this movie, I highly recommend it! It's been quite a while since I've seen Romancing the Stone, but I think I much prefer this sequel. It is just too, too funny! Of course, it might take a certain sense of humor to really enjoy it. But in my opinion, this movie is a hoot! Of course, there's romance (it's what I like, what can I say? ), along with adventure and some witty lines. However, there is also quite a bit of swearing, and a scene or two that could be skipped. For those reasons, I'm wary of recommending it. But I personally love the humor, and I was happy to watch it again. Is everyone comfortable? Did you all find yours seats OK? Good! Today's "features" are Jane Austen movies! I'll start with some of the Jane Austen movies I've seen: Pride and Prejudice (the older version and the newer version, although I fell asleep during parts of the older one--I watched it really late at night! ), Sense and Sensibility (with Emma Thompson and Kate Winslet), Emma (the one with Gwyneth Paltrow and the PBS version that aired this past winter), and Northanger Abbey (the PBS version). I have also seen two versions of Persuasion, as well as the movie Becoming Jane. I loved the newer version of Pride and Prejudice. I think the music was wonderful and it was so artistically done, with beautiful landscapes and settings. And Mr. Darcy! Oh my! If you have seen both of them, which one did you prefer? Which actor did you prefer for Mr. Darcy? 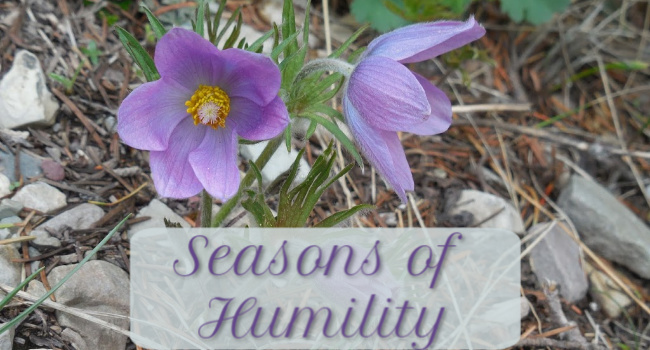 This story shows the importance of humility, which goes great with my blog! Being able to understand (and admit) when you're wrong is hard, but vital. Relationships require humble love in order to last. Sense and Sensibility is also a great movie, and the actors in the version I saw did a superb job (in my opinion)! I love how this story shows the need for balance--it's best not to get carried away with our emotions, but it's also important to express our feelings and not hide them inside forever. I love the ending of this movie and the men the girls end up with! If you haven't seen it, I recommend it! The version I saw was the 1995 version. Oh, and how I love Emma! The version with Gwyneth Paltrow is my favorite so far. I especially love Mr. Knightley! If you want to see a longer version that includes more background (etc. ), the PBS version is very good, as well. However, I just love the way the one with Gwyneth Paltrow was done (and the acting is so very good!). This story is so sweet, and I think it's great that it shows the importance of being friends before really falling in love. How better to know what the man is really like before marrying him? And communication in relationships--being able to be honest with each other--is absolutely key. And I can't forget Northanger Abbey! I saw an encore presentation of this movie on PBS, and I loved it so much that I bought a copy so I could watch it whenever I wanted! I can relate to the heroine of this story--I love to read novels and I have a big imagination (or so I like to think!). I love how this story has a hero who is an honorable and fun man! The lesson of learning to care about the feelings of others, as well as the picture of true love portrayed in the film, make this movie one I am glad to own. How about you? What are your favorite Jane Austen movies? Who are your favorite Jane Austen heroes? Welcome! Please find a seat--there's plenty of room for everyone! If you didn't yet have a chance to grab some snacks and drinks, now's the time, because I'll be playing the previews today. Our first "feature" starts on Tuesday! Shrek Forever After is coming to theaters at the end of May. 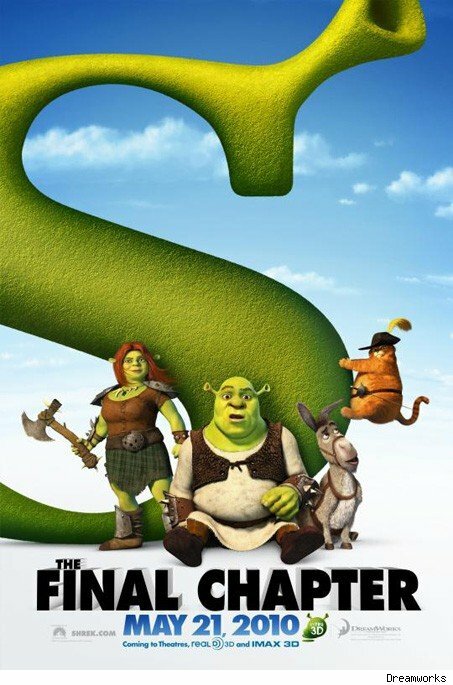 My family and I have seen the first three Shrek movies, and while the second is by far my favorite, I'm sure I won't be able to resist seeing the fourth installment. "A bored and domesticated Shrek pacts with deal-maker Rumpelstiltskin to get back to feeling like a real ogre again, but when he's duped and sent to a twisted version of Far Far Away -- where Rumpelstiltskin is king, ogres are hunted, and he and Fiona have never met -- he sets out to restore his world and reclaim his true love." It sounds like an interesting premise, to be sure. I'm not certain how original the idea of an alternate reality is in the movie world, but I'm willing to give it a try. However, these movies (while very funny) do contain crude humor, which may not be appropriate for young children (or enjoyable for all adults). But for those who are interested, it could be an entertaining choice when going out to the movies later this month! Toy Story 3 is coming to theaters in the middle of June. This is a must-see for me! I love many Disney movies, and I enjoyed both Toy Story and Toy Story 2 (although, like Shrek, the second was my favorite). How could I not see this movie? With great voices for the characters, great animation, and with what looks to be a sweet, touching (and fun!) story line, I'm definitely excited for this movie! And as far as I can tell (if this movie is like its predecessors), I have no problem with recommending it for all ages. Now that I'm home for the summer, I can enjoy watching these movies with my family. Isn't it great to watch movies with those who are "near and dear" to you? I hope that you can enjoy some great movies this summer with your family and friends! There are lots of smiles to go around today!!! I'll start with the winner of the $10 gift card drawing. I did the drawing the old-fashioned way, putting 45 names (out of 11 entrants!) into a hat and having my sister pull a name out. And the winner is . . .
For all those who didn't win this time, don't give up! I'm sure that wasn't the last giveaway to be seen on this blog! And thank you so much to all those who entered! I loved reading about your sweet food memories, and I wrote all those recipes down on some recipe cards! Now, another order of business before sharing a few more smiles with my readers. According to the poll, of the 8 that voted, half (4) of you wanted "Movie Week." I will be happy to honor that request. So next week will be "A Week at the Movies," premiering Monday. So stay tuned! Also, there were 3 people that voted for "Nature Week" (which was a close second), and I came up with another theme that I couldn't resist (from "Nature Week"). So the week after "A Week at the Movies," join me for "Let's Go Camping!" Start packing your hiking boots and swimming suits, and don't forget to come back in two weeks! Renee @ Black 'n Gold Girl's Book Spot : Renee was the one who helped me get this blog started, patiently answering all my blogging questions and encouraging me. She was my first follower! Thanks, Renee, for being such a great blogging friend! Cerella @ The Cerella Life : Cerella not only agreed to do an interview with me on my blog, but she has visited my blog and left comments that make me smile. :) Thanks, Cerella! Lori @ Some of my Favorite Things and ~Some of My Favorite Books~ : Lori found my blog (as many new followers have) thanks to Renee and my Walmart gift card giveaway. Her comment there was so sweet, and after having just seen my blog she posted about my giveaway on her own blogs! Thanks, Lori, for your kind words and support! Ariel @ "The French Poet" (http://www.angelvelvet.blogspot.com/) : Ariel has been leaving so many kind comments ever since the beginning of my blog (over a month ago now!). I really appreciate her! Thanks, Ariel! Ashley @ After All....... Tomorrow Is Another Day : Ashley was one of my first followers (one of Renee's followers who decided to give my blog a chance). Thanks, Ashley, for your sweet words and your faith in me! Angie @ "Never a Dull Moment" (http://neveradullmoment-angie.blogspot.com/) : Angie's comments make me smile, and I so appreciate her interest in my posts! Thanks, Angie! Hannah @ "Project Journal" (http://hcprojectjournal.blogspot.com/) : Hannah is one of my new friends and followers, but I think this might be the beginning "of a beautiful friendship"! Thanks, Hannah, for your compliments and your kindness! Thank you to these people and all the others who have followed my blog and/or left comments (or even just read it!). I appreciate you all so much! To those who I passed this award on to, if you would like to pass this award on to others, please do! I think you should be able to find the link to this picture pretty easily, but let me know if you can't (it's also on my PhotoBucket account). My only rule is that you must tell the recipients why you gave them the award! Anyway, tune in soon for some more fun! Food Flashback: Author Interview with Cerella Sechrist! And now the moment you've all been waiting for! Drumroll please . . .
1. Amber: Did you get to do a lot of research in Hershey? And did you get to go to the theme park? If so, could you give us some fun details from your experiences? Cerella: I did get to take several day trips to Hershey, mostly to immerse myself in the town and its surroundings and get a feel for what it would be like to live there. I spent time with friends who live in the town, but I also did the tourist thing and visited museums, Chocolate World and the like. Instead, I toured things like the Hershey Gardens (which are absolutely stunning, and I highly recommend them for gardeners, flower lovers or anyone who loves to stroll through enchanted places); the antique auto museum; Chocolate World (a must! ); the Hershey Story Museum (which is a fascinating look into all things Hershey); etc. The thing I love best about Hershey is there is so MUCH to do there. It’s a small town, but it’s packed with stuff, above and beyond just the chocolate and the amusement park. It truly is one sweet place. 2. Amber: Do you enjoy cooking like your main character, Sadie? And what is your favorite dessert (or at least one of your favorites—I know I couldn’t pick just one!)? Favorite dessert is a tough one! Because you’re right – how do you pick just one?!? So I’ll just narrow it down to TYPE of dessert. For me, that would be CAKE. And you can keep it simple. Basic vanilla cake with chocolate icing. Or lemon cake with buttercream frosting. Or strawberry cake with vanilla icing. I’m not choosy. But cake RULES. Otherwise, you can just give me a bag of Smarties, and I’ll be content. 3. Amber: What was your inspiration for the story—the spark that set the story in motion? Cerella: For years, I was writing historical fiction but had no luck getting any of my novels published. I finally decided to try something completely different – take myself out of that zone and into a new one. So I decided to write a modern-day romantic comedy, which was as far from a historical drama as I could get. Once I had the genre, I asked myself what kind of story I would like as a reader. Given my love of food, a story about a chef stirred my interest. I loved the idea of writing in that world because it was one I’d never gotten to consider while writing in the historical genre. So once I decided to go for a romantic comedy with a food theme, I needed to consider conflict. It occurred to me that a chef who is good at everything except that ONE THING (like creating desserts) would make for an interesting and relatable character. Throw in more conflict by introducing a rival chef who is VERY talented at her Achilles heel and there you have it. Of course, there are a few more ingredients to the recipe – Sadie’s impish (and entertaining!) five-year-old daughter; her best friend, Jasper, who realizes he’s in love with her and the return of her ne’er-do-well father, seeking to make amends for the past. 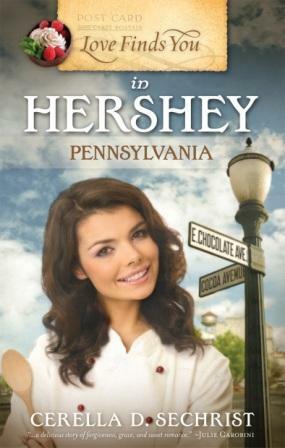 With the food/dessert theme in mind, it wasn’t hard to set my sights on Hershey as a setting, especially since it’s nearby, and I’m familiar with it, having grown up in the south-central PA area. 4. Amber: Could you share some of your future plans for your writing? Cerella: Currently, I’m finishing up the plotting for a stand-alone novel – a historical again. I’m so excited to start writing it since it’s a revision of a book I wrote a few years ago, before I had turned to modern day tales. In the meantime, my agent is shopping around a series about three sisters who are working at mending their broken relationships. It has a little bit of everything: mystery, relationships, romance, redemption, light touches of humor. I love writing about sibling relationships because there are a wealth of layers there – you can love your siblings so much, but they can wound you pretty deeply, too. It allows for some fascinating storylines. Cerella: This question is nearly as difficult as the dessert one!! There are so many food shows that I love. I adore Rachael Ray’s “30 Minute Meals”, I’m partial to Paula Deen, and I’m fascinated by Alton Brown’s “Good Eats”. I also like to tune into Andrew Zimmern’s “Bizarre Foods” on the Travel Channel. That man is fearless when it comes to food. I’ll watch just about anything on the Food Network. It’s one of my favorite channels. That one resonated with me because it does echo some of the themes of Love Finds You in Hershey – that your ability or inability is not what defines your worth. As for other foodie films, I absolutely loved Julie and Julia with Meryl Streep and Amy Adams. It was like Meryl Streep brought Julia Child back to life. I’m definitely a foodie fan of that one! Amber: Thank YOU, Cerella, for your wonderful responses! I appreciate your time, and I am thrilled to host you here at my blog! Also, a big thank you for inspiring "Food Week" on my blog--it was tons of fun! Readers, if you would like to read my review of Love Finds You in Hershey, Pennsylvania, please go here: http://seasonsofhumility.blogspot.com/2010/04/my-review-of-love-finds-you-in-hershey.html. According to one definition from Dictionary.com, conglomeration means: "An accumulation of miscellaneous things." I was at a loss as to what to post today (I think I'm getting too excited about another themed week! ), so I hope you don't mind the clutter! This weekend is going to be so much fun! For my blog, I'll be announcing the winner of the Walmart gift card, and I'll be announcing the theme for next week's posts (there's still time to vote on the poll in the sidebar!). Yay! As for me personally, I'm happy because a dear friend is visiting this weekend, and I'll get to go to my sister's choir concerts and her school's auction. It will be rather bittersweet, however, because I was in that choir for three years before I went to college, and my sister's school is my old elementary/middle school. But I know it will be great to see everyone again, and I know the music will be beautiful at the concert! My dad recently gave me an iPod Touch, which holds 8 GB. My other iPod held 2 GB, which means that I now have an iPod with video capability! Woohoo! Along with that last note, I recently completed one of my albums from iTunes, called Nickel Creek (by a group of the same name). My roommate this last year had brought this CD to our dorm to let me listen to it for a while, and I loved it so much! Would you mind if I share a song from the CD that I found on You Tube? Also, I bought an audiobook on iTunes that I'm planning on giving a whirl this summer. The book is Forevermore by Cathy Marie Hake. I'll plan on posting a review, just as a heads up! Oh dear . . . I really need to stop buying stuff! Please, do not follow my example that I set forth in the last three bullet points! Well, I suppose I should stop now. I am a big fan of organization, so I'll try not to do messy lists like this very often! Thanks for taking the time to read this, and remember to stop by again soon for some exciting stuff! As they build new lives in America, Tora, Elsa, Kaatje, and Karl each experience a personal tragedy that threatens to destroy everything they left Norway to find. Tora’s web of lies has cost her a successful future with the man she loves. When tragedy strikes, Elsa must draw upon her faith and the strength she can muster to discover who she is and the path she must follow. After her husband’s disappearance, Kaatje struggles to raise two young daughters and tend her farm, and Karl finds himself caught in a life of loneliness and emptiness. Only by placing their trust in God—and in each other—will they pass through these rough waters and find the safety of the harbor. From the richly forested banks of the Washington Territory to the burgeoning city of Yokohama and across the turbulent, danger-filled waves of the open sea—experience the epic saga of perseverance, pain, faith, and calling in the Northern Lights series." I knew I wanted to read this book after reading the intriguing excerpt at the end of The Captain's Bride (the first in the series), and I'm so glad I did! Deep Harbor covers the lives of several different characters, all of whom have their own problems they must confront. I loved how real the characters were, yet not without hope. The author never gives up on any of the characters (even Tora! ), and that made me want to keep cheering them on, as well. The way Bergren describes them and their surroundings is beautiful. However, I was a bit thrown off sometimes when events happened abruptly. That is to say, I felt sometimes that not everything was as fluid or smooth as I preferred, but that was my own perception. None of the scenes were overly choppy at all, and overall I loved the story! It's a story full of vivid emotions and exciting action/adventure as the characters strive to follow God's will and trust in His guidance. I also love how WaterBrook Multnomah Publishing repackaged this series, and I really, really hope that they do the same for the third book! I think I've been too involved in these characters' lives to not find out what happens next! And what a great deal for only $6.99! I highly recommend Deep Harbor (and The Captain's Bride, as it is nice to read the books in order to get the whole story)! For the Love of Others . . . Even though there were only four people who answered the question, I think it is safe to say that it is our time spent with each other that makes summer special for us--whether with family or with friends. I have been blessed with amazing parents, as well as other wonderful family members, and great friends (like my friend Elena pictured on the right)! Summer affords many of us more time to spend with each other and sunnier days in which to do more together. And we ought to value every moment we have with each other, because the relationships God has given us are great gifts indeed. But there is one more Friend who we ought to spend more time with this summer, and every day of every season: our Lord. Jesus said (as recorded in John 15:14-16), "You are My friends if you do what I command you. I do not call you slaves anymore, because a slave doesn't know what his master is doing. I have called you friends, because I have made known to you everything I have heard from My Father. You did not choose Me, but I chose you" (HCSB). Through God's grace, we who are His disciples (believers) are friends with Jesus! What a grand truth that is. If you are saved, you have a personal relationship with the Lord of all, and it is He who we should spend the most time with this summer. May we (including myself!) remember to use our time wisely as spring begins to blossom into summer and bright days beckon us out-of-doors, into the beauty of God's creation. Note: I am going to have a different kind of poll this time, so if you wouldn't mind I'd really appreciate your input! The poll will be posted in the sidebar soon! Thanks to all of my readers--I appreciate your time and your kind comments.